The Smart Pumper™ is a Universal Platform (proven hybrid PLC+SCADA technology) that provides high-speed global connectivity through six forms of built-in communication (Works in Your Country on the Network of Your Choice) AND with its processor and automation software can help you manage virtually anything remotely including VFDs, Control + Monitor + Automate + Data Log + Meter + Diagnose and Analyze assets as you require. The Smart Pumper Integration Team provides and delivers Turnkey Solutions helping Customers meet and exceed their needs by handling Material Procurement, Assembly, Installation, Set-up, Activation, Training, and Back Room Diagnostic Support. Smart Pumper™ platform was first engineered and manufactured (2008) to interface with and remotely control artificial lift (pumping) applications with a variable frequency devices (VFDs) and gather other operational sensors data such as tank levels, metering and pipeline pressures. After a decade of service and continued development, hardware manufacturing is in the third generation and software development is far more than a proven platform used to just control and monitor various forms of artificial lift. It now conducts the balance of remote operations in harmony with artificial lift. See Current Applications and a Case Study by Staatsolie which compared Smart Pumper to others. We achieved 18%-58% increases in productivity and delivered more for less. Also see how you can Create a Smart Field Today with One Device. We Engineer, Procure, Assemble, Deliver and Install Turnkey Solutions that utilize the Smart Pumper Platform with other material requirements to meet Customer needs. When delivered, our Turnkey Solutions will meet and exceed your needs by providing the requirements you requested today “for less” with available scalable options that can be used by you tomorrow. We Engineer, and Design Solutions based on Customers’ Listed Requirements. We are a distributor for most products provided in our turnkey solutions such as VFDs, Meters, Sensors, Electronics, Enclosures, Communications including 4G VAR (European and North America Networks of Your Choice), Downhole and Surface Pumps, Proportional Valves, Solar Arrays, and Other Supplies often required in Turnkey Bid Proposals. As a result, we can pass on additional savings. “Smart Pumper™ Automation Packages” are assembled and organized to deliver the Horse Power required (VFD if required) with the necessary relays and inputs to control and monitor the things you need to satisfy your objectives. 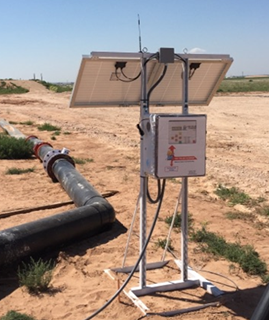 Shown Above: A Smart Pumper System metering a pipeline, monitoring water quality and calculating inventory in a nearby reservoir. 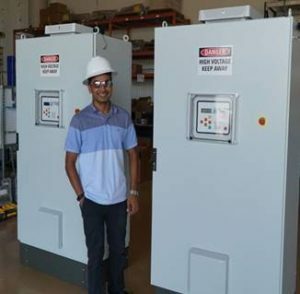 Shown Above: Two Smart Pumper Automation Packages with VFDs to control and monitor a 450-HP and a 600-HP Salt Water Disposal Operation. To date, over 95% of the world’s population resides in areas where 2G mobile wireless data transmission is provided by Local providers. The Smart Pumper supports 2G, 3G and 4G/LTE connectivity as well as 900 MHz, 802.11, Modbus, Ethernet and RS232. 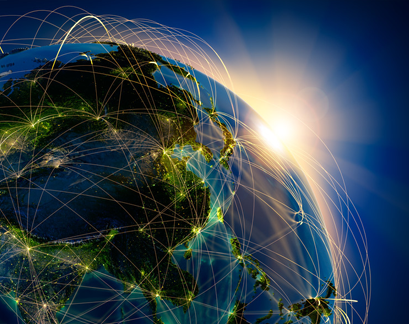 The Smart Pumper Integration Team working closely with the In-Country cell service provider of your choice can quickly create private VPN network tunnels for the global community to access assets in other Countries securely. In addition, we insure where required that Data and Control never leaves a given Country; from your server in your Country using the network provider of your choice having no access from outside the Country. Once the unit is running would we be able to monitor from any computer thru the internet? Yes. The administrators of the Smart Pumper™ Automation Server software can provide passwords and usernames to specific parties that the supervisor may want to have access to wells and/or facilities. These users can be given various degrees of authority from view only to full administrative capability. If we were to connect to our server what would be involved? To use a Company in house server versus outsourced server, the following would be involved. a) License Smart Pumper™ Server Software (minimal annual fee). b) Set up a Private APN/VPN tunnel to secure your data transfer from your wells and facilities to your server. We provide the special firewall router that is compatible with local 3-4G provider and connect it to your server with the help of your IT department. Once installed, we would activate the private APN/VPN tunnel with your service provider on your behalf. This process generally takes about a week. Are there any additional costs not included here that are required for this system to be operational? (the cost of the communication network). Although the Smart Pumper™ Automation package works independent of communication, there will be monthly communication network charges from your service provider to provide this service as well as maintain their network. Thankfully this is a very small and reasonable cost typically less than US$17 per month with contact to site every ten minutes for data and on demand for control 24/7. The system is guaranteed to work on deployment. And, although electronics typically do not have warranty due to the harsh outdoor environment, the Smart Pumper™ PLC has a 12 month warranty. If it breaks for any reason other than obvious high voltage spike, we will exchange it for free for your field personnel to change it in the field. Also, because the Smart Pumper™ data logs the enclosure temperature over time, you will be able to better hold the VFD manufacturer accountable as well. Being able to show them that the temperature in the enclosure never exceeded environmental specifications goes a long way to holding them to their warranty commitment. What has the reliability been with these units? 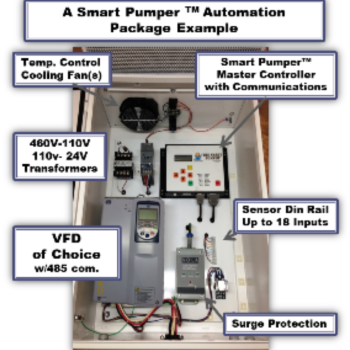 The Smart Pumper™ Automation packages have been in service since 2008 trouble free. Software revisions to add features such as flow meters, VFD manufacturers and other customer requested features are ongoing. CE FCC, Canadian and European certifications were awarded in May 2011.
a) Easy to install and setup? Yes. b) Can be up and running in a matter of hours? Yes. c) Robust built? Yes, hermetically sealed -40 F to 170 F.
Are there vibration sensors that can be used with this unit? Yes. Vibration sensors are currently being used with the Smart Pumper™ Automation system. These are commonly either “on or off” given the tolerance set. There are several companies which manufacture vibration transmitters which will provide simple acceleration, velocity or displacement via a machinery mounted accelerometer. With that approach, a conditioned vibration measurement can be sent back to Smart Pumper™ via a 4-20mA loop for trending and monitoring. Smart Pumper™ can also provide an email Warning or even trip-off the machine if Fault level measurements are detected – A very cost effective strategy for vibration monitoring. The data is stored on the Smart Pumper™ device and uploaded to the server every ten minutes. There is a Real Time Clock in the Smart Pumper™ that syncs to the server and allows for back filling as well. What type of software training is necessary if any? Most of the software is very intuitive Windows based technology. Training is available worldwide via PetroCom in Trinidad and Smart Pumper in North America. You must login, in order to download the manuals!